A few months after I started inkle weaving, I started playing with more advanced inkle weaving techniques. I managed to learn a couple of these techniques from piecing together information from the internet - mainly, I learned about two methods. The first was the stripes method of pick-up, which I'm not displaying in this post (I'll try to remember to take pictures of my trial with the stripes method and post them). The second method was the basketweave method, which I've also seen called the baltic method. This creates a checkerboard of one color against a solid background in the plain weave (without pick-up). It is woven by weaving two strands of background color between each strand of pattern color. Below, I show an example that would give a checkerboard of 11 pattern strands - 6 in one layer, 5 in the next. I've marked the pattern chart with H for heddle strands and U for unheddled strands (though, really, you could flip this - it's not important). This type of staggered graph paper is inkle weaving pattern paper, inspired by Anne Dixon - it shows how the strands truly come together to form your pattern in a plain inkle weave (without pick-up). If you follow the pattern from left to right, zigzagging between the H and U levels, you can see it's green white white green white white green white white green... etc. One pattern strand, two background strands, repeat. 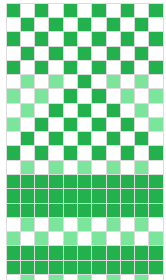 Then, to make the pick-up pattern, you just use *regular* graph paper, not inkle pattern paper (like above), because you're only going to be manipulating the green strands, and those pattern strands make a regular checkerboard (squint at the above pattern and just look at the green strands - checkerboard, no?). I made up an example of what this manipulation could look like below. The dark green is the strands that you're going to show, and the white spots are where the strands are on the other side of the weave (they are below where the shuttle will pass). The first five rows show what would happen if you do nothing, and just pass the shuttle through like normal. Then, I start dropping strands - the pale green shows where the strands *would* be normally, but I'm dropping them to create a triangle effect. The shuttle will pass above the dropped strands. Then I drop an entire row after the triangle. Then I pick up three entire rows, drop two rows, and pick up two more rows. To make a solid row, you actually reach through and pick up the green strands from the lower set of strands and lift them up to pass the shuttle beneath them. And that's most of what there is to basketweave/baltic pick-up weaving! I do have a few more fiddly tips in the notes on my weaves below. The opposite side of your weave will show the opposite pattern of green threads as the side you designed your pattern on. One nice variation is to make the pattern threads of a thread that is twice the thickness of the background threads - they pop out much more. I just made my first weave using larger pattern threads a couple weeks ago. I'll try to remember to take photos soon and post them. Now I'm going to show you two of the weaves that I made using the basketweave/baltic method. The first one is inspired by the Middle Kingdom's fencing award, the Cavendish Knot. This was one of the first big pick-up projects I did, and there were two main things I learned from this. The first: because of the way that warp strands are longer/taller than they are thick (which is why the inkle weaving pattern paper has rectangular boxes instead of square boxes), it took some playing to figure out how to make the horizontal and vertical bands roughly the same width. If you look closely at the portion in between the cavendish knots, where there's a cross, you can see that it is four wide one way (the long arm) and three wide the other way (short arm). Perhaps you could make this closer to a 1:1 ratio if you used a weft strand that was much skinnier than your warp pattern (green) strands, because then they wouldn't lengthen as much. I haven't tried doing that yet. You'd still need to have a weft strand that matched the color of the background. The second thing I learned is that you should be careful to make any of your floats (the name for the long strands that are dropped or picked up - either a completely solid green line along the length of the weave or a completely dropped [white/pale green in the pattern] line) only about 5 long at their longest - though you can perhaps get away with 6 or 7. This is because they get really loose and are able to snag on things if they aren't sewn down. You can't see the floats (all dropped threads here, in the larger white portions of this weave), because I sewed a green linen backing on to the weave to protect them all. Sewing the floats down isn't hard - I did it on another one of my weaves (which I gave away... I'll try to see it and take pics of it) with the background thread and a needle, but it's more work when you're done weaving to finish the piece. Long floats on the back of a piece also aren't important if you know you're going to be sewing the weave down onto cloth afterwards (trim on a bag or garment, for example). This piece was given to a friend for the strap of a back sword sheath, so it was given a linen backing to give it extra durability, too. This next piece is one of my most recent pieces. This was a basketweave/baltic pick-up piece that was woven randomly - I just wove whatever I felt like weaving as I went. A friend who is an expert in Viking research told me that it was what the Vikings appeared to do a lot in their weaves. The need to make weaves and clothing symmetrical and with an even, continuing pattern is apparently an Anglo-Saxon trait. Vikings just wove whatever they felt like weaving. I must say, it's nice to do, not having to follow a pattern. These are the same weave, but flipped over - compare the sides to see how the front and back differ! They are laid out the same in each photo. Also, I didn't notice this until after I'd cut it off the loom, but I wasn't paying attention to my tension with the weft... you can see how I ended up much looser than I started (one end is wider than the other). Pick-up weaving takes much, much longer than plain inkle weaving, but the results sure are neat! I have more examples of advanced inkle weaving techniques, and I hope to put up more information on them. :) Please let me know if you have any questions, or tips on how this could be better explained - I'm hoping to run an advanced inkle techniques class at some point in the next year at a Pentamere SCA event... writing these posts will hopefully make that easier to put together! Click for more of my examples and notes on basketweave/baltic pick-up here!